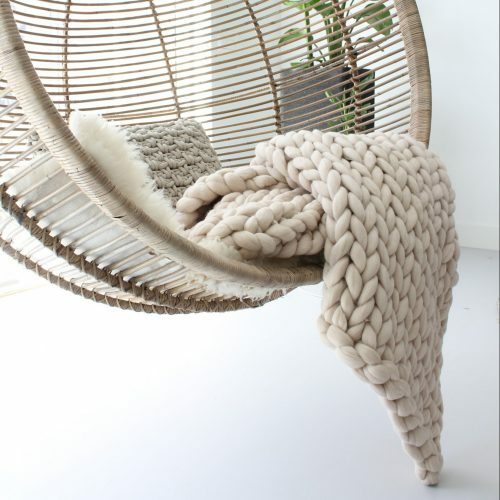 They remain a beautiful addition to any interior: the chunky knitted plaids. For styling your bedroom, that one little corner or just for nice warm (summer) evenings… they are great! 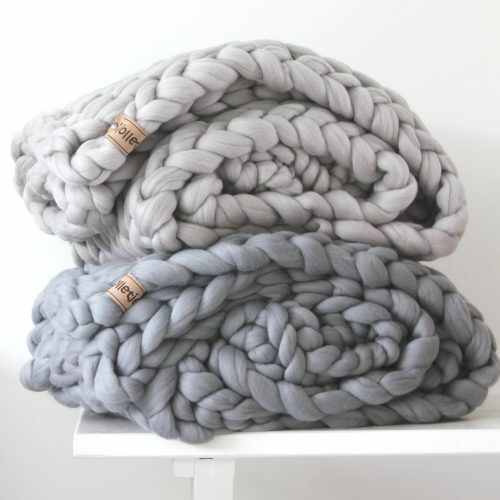 But then, if you start your online search… It turns out that there are a lot of blankets on offer. And you read very different stories about them, not all positive. And how do you know if you really buy a good quality throw? 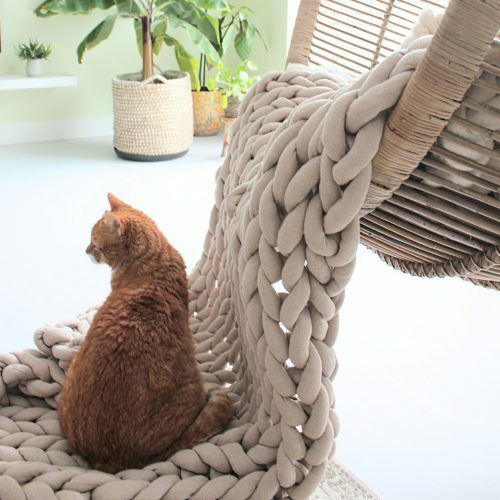 If you begin your search by reading this blog with 5 tips, you can start buying a chunky knit throw with peace of mind. Tip 1: Which material do you want? They all look a bit the same, but they are not. The chunky knit plaids are sold in all kinds of materials. Natural materials: these are the different types of wool. The nice thing about wool is that it is antibacterial, moisture-regulating and self-cleaning. There is a lot of difference in how the different types of wool feel or how quickly they fluff. Merino wool, for example, is much finer than other sheep wool. For the differences also read tip 2. Undyed wool smells like (fresh) sheep, some find it great but not everyone likes it. With dyed wool, the sheep smell has usually disappeared. Synthetic materials: these are for example polyester and acrylic. These materials are cheaper than wool, so many budget variants are made from it. Keep in mind that they often fluff faster, are less soft and can smell more artificial. The appearance can still be beautiful. A combination: cotton filled with hollow fibre. This creates a thick cotton tube, which gives the same appearance as the woolen plaids. Cotton is often slightly less soft than wool, but does not fluff and is washable. Plaids made of this material are also suitable if pets or children use them, and they last very long. Because the material is labour-intensive to make, cotton plaids are the most expensive. Tip 2: How soft should it be? When buying from a screen you can’t feel the material. Luckily you can pay attention to 2 facts for woolen plaids: the type of wool and the number of microns. Merino sheep give the softest wool. Their wool fibers are thinner and softer than those of other sheep. But there is also a difference in quality within merino wool: the number of microns of the wool. The lower this number, the softer the wool and the higher the quality. Do you remember those itchy jerseys from the past? They are made of wool of 27 microns or higher. One person is more sensitive than another, but the rule of thumb is that wool above 27 microns itches on your skin. If you don’t want itches, go for wool of 26 microns or less. And to top it all off: wool with a lower number of microns is also much less likely to fluff. Merino wool of 19 microns is of course also more expensive than raw sheep wool of 30 microns. With these facts, you can make the trade-off between costs and the use of your plaid yourself. Tip 3: Do you have children, pets or do you like to build your own huts with your plaids? Then there is only one advice: go for cotton! Wool and synthetic plaids will not last as long if they are used intensively, or if nails are digged into them every day. You can maintain and care for your woolen plaid, but it is not able to cope with building huts every day. The plaids made of chunky cotton are strong and washable. Ideal if you carry them around a lot or if they sometimes have dirty hands on them. Tip 4: Are sustainability and animal-friendliness important to you? Then take a good look at the quality marks and information about the material. An important point with wool, for example, is its origin; can it be guaranteed that the wool is mulesing-free? Mulesing is a serious form of cruelty to animals, which is/was applied to merino sheep. This point also depends on the price; in the case of budget variants, no information is generally given on this. Unfortunately there is no official (international) quality mark, but information is available from most suppliers and producers. You can also look at organic quality marks, such as the GOTS quality mark for textiles. A GOTS quality mark sets requirements for environmentally friendly production and packaging, good working conditions and a fair wage in production. An Oeko-tex 100 quality mark applies to dyed wool or cotton, which tells you that no substances harmful to you have been used for the dyeing. Tip 5: Can you return your order? It seems like an open door, because nowadays we are all used to our right of return on online orders. Unfortunately not every webshop complies with the (EU) law on this point. Despite all the tips, it can happen that you receive a product that is different from your expectations. For example, because the color on your screen looked different. If you can order a color card in advance, that helps of course, but it can still happen that you want to return your order. What is useful to check in advance: the registration with the Chamber of Commerce and if there are General Terms and Conditions. Registration with the Chamber of Commerce is necessary, so that you can invoke your legal rights as a consumer. These do not apply if you buy from an individual. 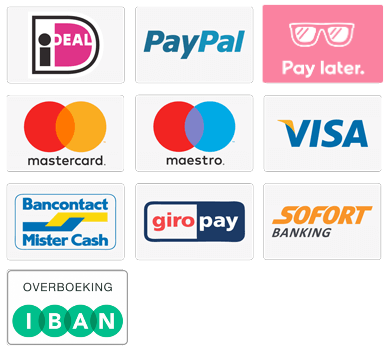 The General Terms and Conditions describe under which conditions you may return your order and whether, for example, the return costs are for yourself or for the webshop. As a consumer, buying online from a webshop based in The Netherlands, you have the legal right to return a webshop purchase within 14 days. This also applies to handmade products and sale-items. There are exceptions to this rule, such as products that are personalized or custom made for you. As an example: all WolletjeBol products are handmade, after your order. However, this does not count for the law as customization, because you can choose the color and size in the webshop. This makes it a ‘standard’ product, which falls under the right of return. This website has more information about your (EU) return rights. And, do the tips help you? Does it give you more clarity if you want to buy a chunky knit throw? If you have any other questions, feel free to leave a comment under this blog.